This remarkable valance, virtually complete, cannot have seen much use since it is still in prime condition with unfaded colours. Many textiles of this age have been damaged by light so that their colours are now subdued and appear to be in a limited range of dyes. 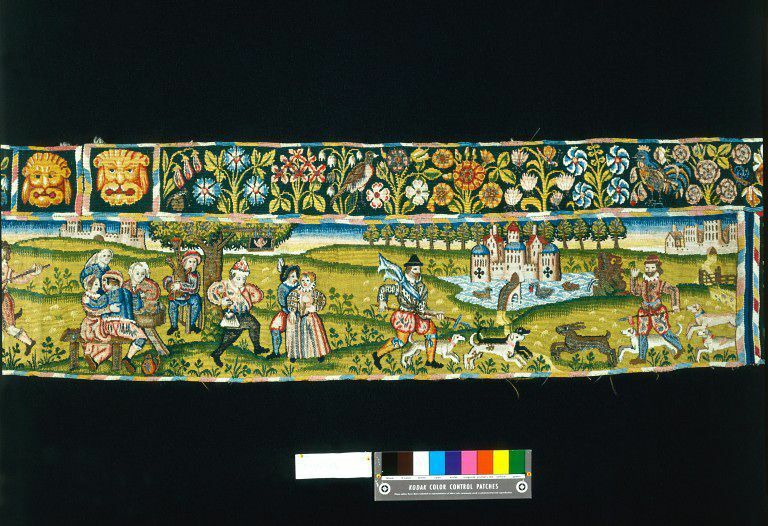 The valance is particularly important in demonstrating how very bright and vibrant the colours could be in the 16th century. 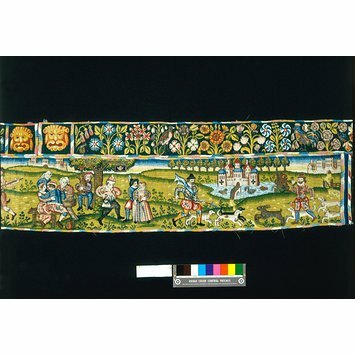 It is the only known valance that might have been woven at the Sheldon tapestry workshop. The valance would have been hung around the top of a bed, together with curtains. Bed furnishings provided warmth and decoration. Many had lively narrative scenes or favourite motifs in bright colours. The idealised hunting and country scenes, separated by vases of fruit and flowers, show some of the favoured pursuits of 16th- and 17th-century England. The limited sense of perspective is still provided in much the same way as it had been in tapestries of the 15th century, with scenes in layers set on hilly slopes. The topmost layer showing small trees and castles gives a sketchy impression of the far distance. The valance is composed of a narrow floral border above a long narrow strip with hunting scenes against a landscape background. The border is in three pieces, stitched together: 96.5; 193; 289.6 cm long respectively (the latter has an uncut division 96.5cm from the selvedge). The valance is in three pieces: 203.2; 143.5; 203.2cm long respectively. Made at the Sheldon tapestry workshops at Bordesley, Worcestershire or Barcheston, Warwickshire. Purchased with the assistance of the Art Fund, Sir Frederick Richard and an anonymous donor, in 1934 from the executors of Colonel Henry Howard (RP 3144/1934).